Earlier this year, I had the good fortune of acquiring a gift certificate to an all-inclusive resort in Boquete (bow-ket-a’), Panama, while at a silent auction for a domestic violence awareness fundraiser. It allowed me to assist with domestic violence awareness while getting an opportunity to travel to a new place; a win-win! I had visited Central America before on a trip to Costa Rica, which shares a border with Panama. I loved it, so I convinced my husband that this would be a great vacation, and we invited another couple from work to join us amd make it a group adventure. As with many Americans, prior to visiting the area, the only thing I ever learned about Panama was a brief bit about the Panama Canal. This man-made canal, built by the United States, helps get cargo ships from the Pacific to the Atlantic and back, without having to go around South America. I also knew that there were big rainforests and several volcanos in the vicinity. My travels would teach me that this country is so much more. The gift certificate was for a resort in Boquete, which is located at the western edge of the country, near David—not at all close to the Panama Canal—a site we wanted to see. With the help of modern technology, I managed to get us a 3-day layover in Panama City and was able to book several different tours for the days we were in town. Tip #1: Flights from northern states take all day, so don’t book any tours for the day you arrive. The first of our day tours was with a company called Barefoot Panama. Our guide, Kevin (the owner), took us on a walking tour around old town Panama City. We also visited Miraflores Locks, where we got our first glimpse of the Panama Canal. There is a marvelous museum there, as well as multiple levels where you can watch huge cargo ships get pulled through the canal. After the walk and our stop at the canal, we went through a miniature nature preserve where we saw a sloth in a tree and starfish with colors that I have never seen before. I would recommend this tour to anyone visiting Panama City, especially if you can do it on the front end of your trip. Kevin is so knowledgeable about the history and current events of Panama, it is an excellent way to gain some familiarity with and understanding of the country. Our tour ended at a local restaurant, where we got to sample some authentic Panamanian cuisine. The second day, we went on a tour of Monkey Island, in Gatun Lake, with a brief stopover in a native village on the Chagres River. The monkeys were cute and friendly, and guests were able to feed them from their hands. The native village was interesting, but too short a visit to truly get a glimpse of the culture. There are seven native communities still subsisting in Panama. Although many use modern technology, such as solar panels, for electricity and light, they still live in huts made from local materials and lead a relatively simple life. I was disappointed by the brevity of our visit because I had so many questions about their culture! While the tribal leader spoke, using an interpreter, there was no time provided for questions. There was also a language barrier, even with the interpreter. T ables were set up so the villagers could sell souvenirs. I appreciate the effort put into hand-made items, and took the opportunity to purchase some goodies for friends and family back home. The women and children performed a traditional dance before we left, and then the children took our hands and led us back to the boat we came in on. It was intriguing and entertaining, and I left wanting more. Our final day in Panama City began with pouring rain. And not just a little sprinkle. I’m talking about buckets and buckets of rain! It had rained a couple of times since we arrived, but this was like a monsoon. Luckily, it began to clear up as we reach the large Catamaran that would take us humpback whale watching en route to the Pearl Islands, in the Caribbean Sea. There we would enjoy a relaxing beach day. Sailing out to the island was fantastic. We saw such a large number of humpback whales that we eventually stopped counting. We also came across several pods of spotted dolphins, with 100-200 dolphins per pod. Spotted dolphins are very friendly, and they swarmed the boats as we passed near them. It was so fun to watch them jump and swim around! At one point, a humpback whale mother and her calf came right up to the edge of our boat. It was breathtaking! Everyone around me was busy snapping photos, but I was too awestruck to think about my camera. I just wanted to enjoy the moment; one that I may not get a chance to see again. It was a magical moment as the mom, on her back, prompted her calf to breach just a little bit with its side fin— almost as if it were waving to us land lovers. Tip #2: Tours are a great way to see lots of things in a short time, and it is easy to miss the full experience if you have your eye in a camera lens the whole time. Make friends with the other people on your tour, and share photos afterward. That way, everyone can take some time to truly enjoy the experience, without feeling as if they are missing out on proper documentation. Our island paradise felt a little less dramatic after the excitement over humpback whales and dolphins, but it was still beautiful. The rain stopped once we left the city and entered Caribbean waters. It turned out to be a perfect day and a perfect way to end our stay in Panama City. We were ready to leave the chaos behind. It is a large, metropolitan city after all, with over 1.5 million people, and just as many cars! Tip #3: Remember, if you want to drive anywhere around Panama City, give yourself plenty of time as the traffic there makes grid lock sound good. On a positive note, Uber is fully operational there, and is cheaper than cab rides. We took an Uber to the international airport in Panama City to catch our connecting flight to Boquete. As foreigners traveling on a domestic flight, we weren’t able to check in online. We were directed to what felt like a deserted part of the airport, with strangely wrapped packages lining the hallway. They made me think of our proximity to Colombia, and we sped up our pace. Eventually, we found our way to the domestic “terminal” which is just a room, where we were transported to our plane. Forty-five minutes later, we landed in the smallest airport I have ever seen. We collected our luggage, and stepped out into hot, humid sunshine. With only a little confusion, we managed to locate Los Establos Boutique Inn. After being in a large city for 3 days, we were relieved to discover the area’s tranquility. We began to relax as we took in our new surroundings, nestled on a hillside with a view of Volcano Baru. Tip #4: Luggage is strictly controlled on regional flights, with a max 30 lb. bag weight per person, and you may be charged for overweight bags. Boquete translates to gap, which seems appropriate as the town is set in a narrow valley, surrounded by coffee plantations and rainforest. There is a picturesque town center, and plenty of bars and eateries to explore. We stopped at one of the bars to get a drink, but chose not to try the eateries. Los Establos is an all-inclusive resort that serves gourmet meals three times a day, and we wanted to take full advantage of that perk. If you enjoy resort-style vacations, I highly recommend Los Establos. The food is delicious, served restaurant-style (not buffet), and the restaurant offers both Panamanian and American options at every meal. The staff is very friendly and accommodating. When we arrived, it was between meal times, yet we were asked more than once if they could make us something to eat. Rooms are well-appointed and spacious. There is a shared kitchen in the main building with a refrigerator that is kept stocked with local beers, water, and soda. It’s accessible 24-hours-a-day. Happy hour is held from 5 to 6 each evening, allowing travelers to get acquainted. Tip #5: When staying at a resort like Los Establos, take advantage of social opportunities and pick other travelers’ brains about where they’ve been and what they’ve seen. When your time is limited, it helps to narrow down your priority destinations and activities. One of my favorite things about Los Establos was the exceptional tours they offered, and that they are included in the price of the resort! Excluding travel days (arriving and leaving), each person gets one tour per day included in their stay. On arrival, they provide a list of tours to choose from. 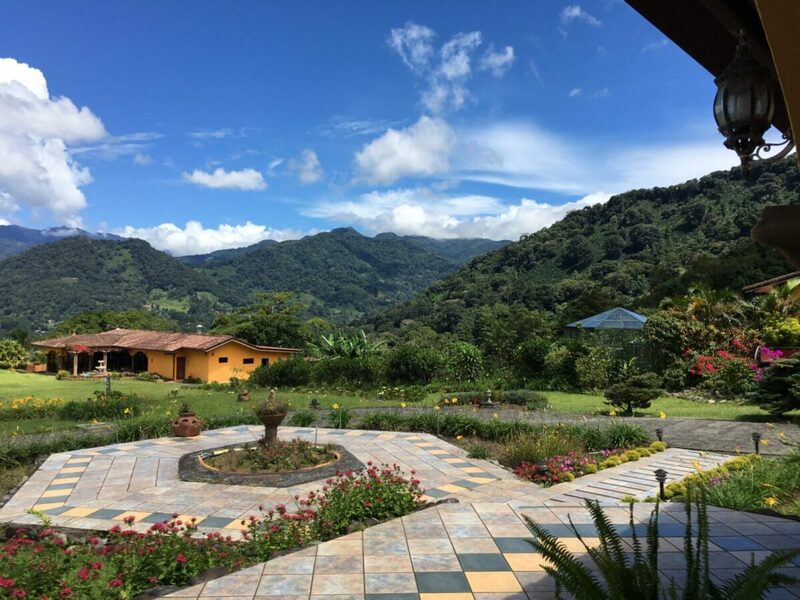 Some of the choices include zip-lining; a panoramic tour of Boquete; bird-watching, a waterfall hike; a hanging bridges hike; tours of honey bee and coffee plantations, Gualaca mini canyon (a.k.a. 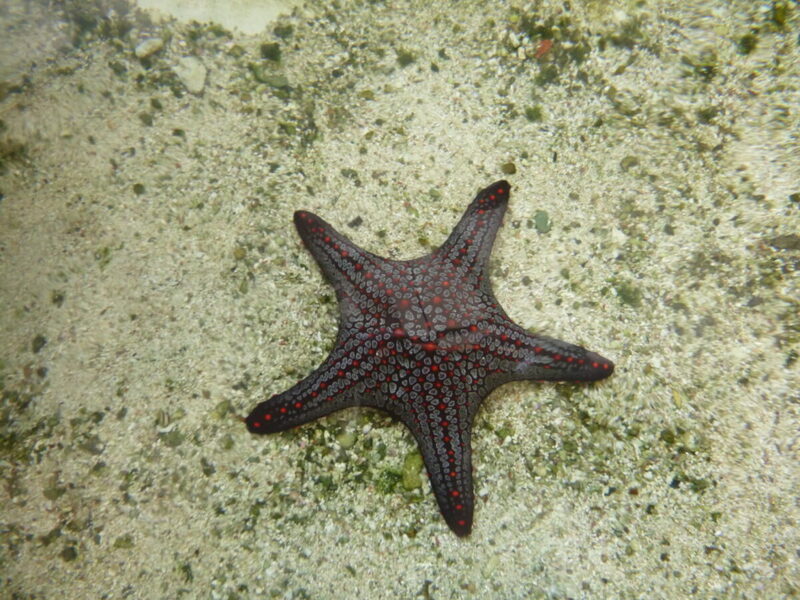 cangilones), and even white-water rafting. The tours are mostly designed to last half a day, making it possible to attend a second tour or have some time to explore on your own. During conversations with other travelers, we heard about the sunrise volcano tour to Vulcan Baru, which begins at 3:30 a.m. with an open jeep ride through chilly mountain air to the top of the volcano. Guests enjoy coffee and an almost-360-degree view as the sun rises to reveal the Pacific Ocean, the Atlantic Ocean, and Costa Rica. If you are a morning person, this tour sounds fantastic, but we chose not to get up that early while on vacation. I would not recommend this tour for elderly or infirm guests, as the road is extremely rough and not well-maintained. The jeeps come equipped with 4-point harnesses, and according to the group we spoke with, you will want them. Tip #6: When choosing and arranging tours in a new place, do enough research to ensure that it will work for all of your companions. If you have children or elderly travelers with you, or if anyone in your party is disabled, be sure there are appropriate accommodations. Our group opted for relaxation and signed up for the coffee plantation and honey bee tours. The Don Pepe Estates coffee plantation and processing mills are the oldest in Boquete, almost 100 years old! During the tour, we were shown different types of coffee beans, and how they are harvested by hand before drying. The pickers, mostly local Guaymi Indians (Ngobe Bugle), are paid around $2/30lbs of beans picked. Following the plantation tour, we tasted a variety of coffees grown locally. We were instructed to taste the delicious, caffeinated liquid as professional tasters do, by smelling it first (similar to wine tasting), then slurping the hot liquid down. Yes, I said slurp. It is the proper method— something about mixing air with the liquid. It was weird, but quite good, actually. It was fascinating to actually taste the different flavors in the coffee and I’m told nothing tastes better than a fresh-roasted bean. I highly recommend this tour for both the beauty of the landscape and the educational cultural experience. The honey bee tour was similar to the coffee plantation in its format. Our guide walked us through a natural reserve for bees. The bees they keep are mainly tiny and don’t have stingers, so it wasn’t scary at all. As we walked, our guide talked about different types of honey bees, including hybridized African bees, and how important they are to the world’s ecosystems. At the end of the tour, we got to taste around 25 different types of honey. An unexpected bonus of the bee tour was a fascinating butterfly atrium. It is full of an amazing variety of butterflies, many that we had never seen before. Some of them were translucent! 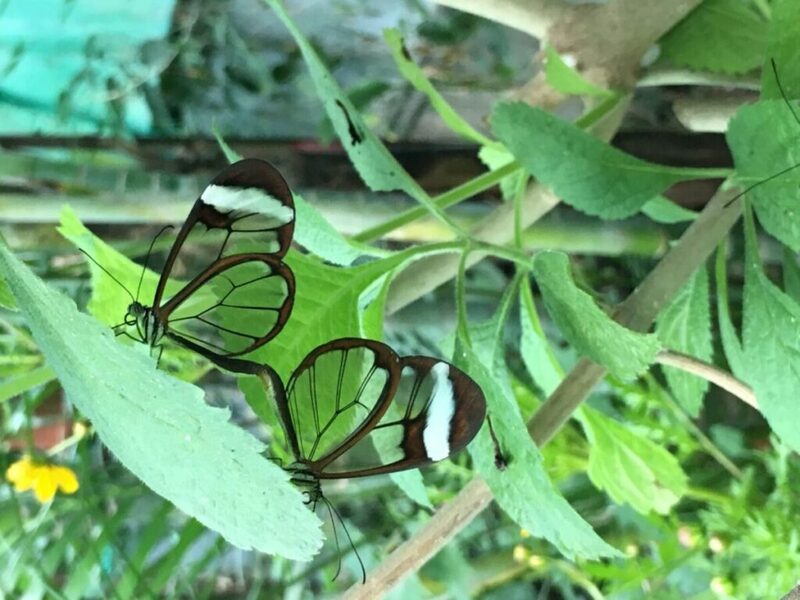 We later found out that some of these glasswinged butterflies have bright colors around the edges of their wings. 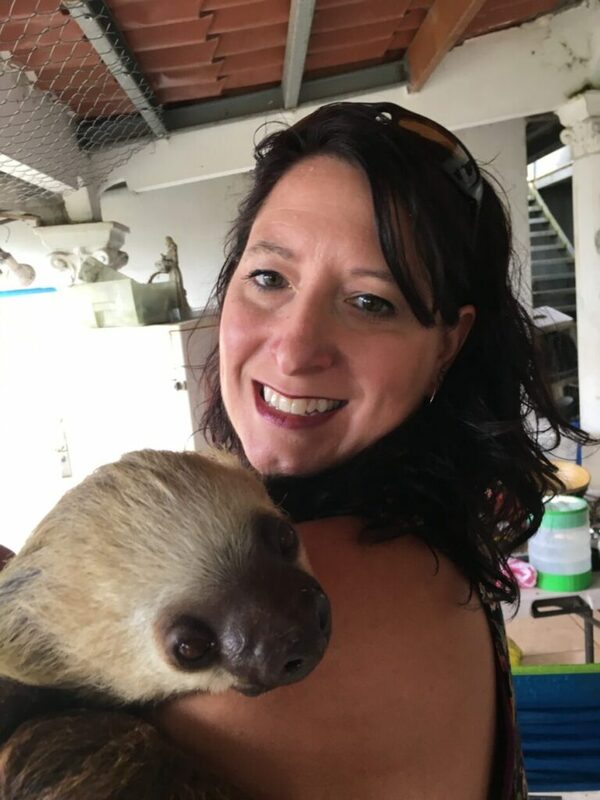 One evening, during a conversation with a group from Texas, someone mentioned that her favorite activity at the resort was holding a sloth. My ears instantly perked up! Glancing at my husband, and I saw him lower his head with a sigh. He feels no personal compulsion to get close to wild animals, but he knows that I can’t resist. (I dragged him to a sanctuary in Madagascar to hold and feed lemurs, so he’d been there before). The couple we were traveling with said they would love to have this experience as well, so the decision was made. Originally, we had planned to take the zip-line tour but were able to switch at the last minute (we’d all been zip-lining before, and none of us had ever held a sloth). Tip #7: Be flexible! Most resorts have you sign up for tours ahead of time, but are pretty flexible when it comes to switching, as long as there is room. Surprisingly, one of my favorite parts of our sloth adventure was the drive. A little over an hours’ journey from Boquete, the winding country road takes you through mountains and rainforest to green pastures full of livestock, and eventually to another small town called Volcan. The sanctuary itself, Raquel’s Ark, is a humble residence surrounded by concrete walls. Raquel established the Ark to rescue and rehabilitate abused and injured animals in Panama. 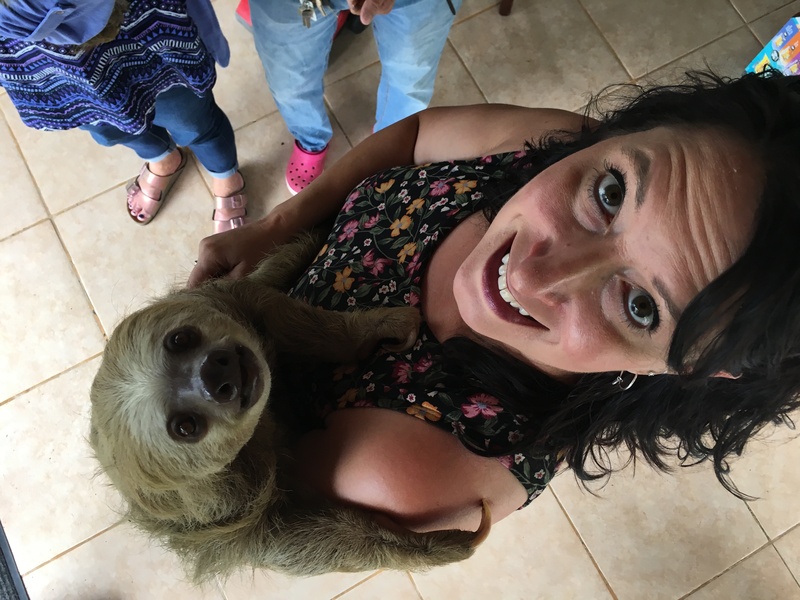 When we met her, she was holding two sloths, which she immediately passed to us. They were soft and calm. Raquel later told us they are nocturnal, and usually sleep during the day. Sloths are primarily tree dwellers and don’t much care for being on the ground. As you hold them, they look up a lot, searching for a branch to wrap around and sleep on. Although the offering of some food (almonds) seemed to make up for the lost nap time. 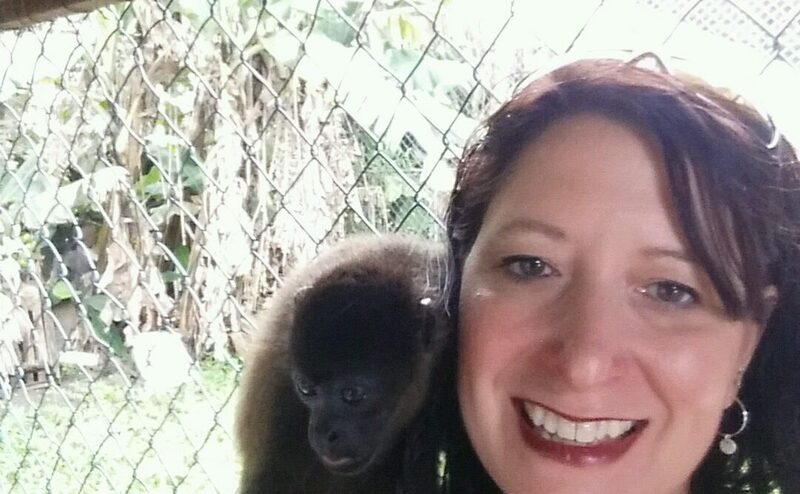 Raquel walked us through her sanctuary, where we met a rescued raccoon that she’d nursed back to health, a 17-year-old leopard who is too old to be released back to the wild, three young howler monkeys full of energy, and two white-faced capuchin monkeys. She also had a small band of white coatimundi. The refuge’s goal is to eventually release the animals back to the wild, but it doesn’t always work out. The sloths and the leopard can’t be released due to age, so they will remain with Raquel. Raquel’s Ark depends on donations to support her efforts. 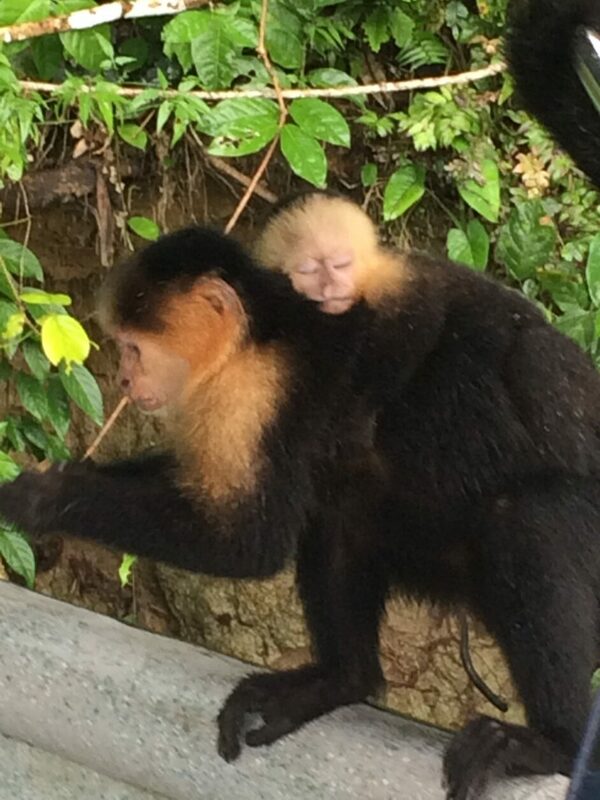 Animal sanctuaries are few and far between in Panama, and the service is much needed. This tour was by far my favorite of our trip and I highly recommend it. 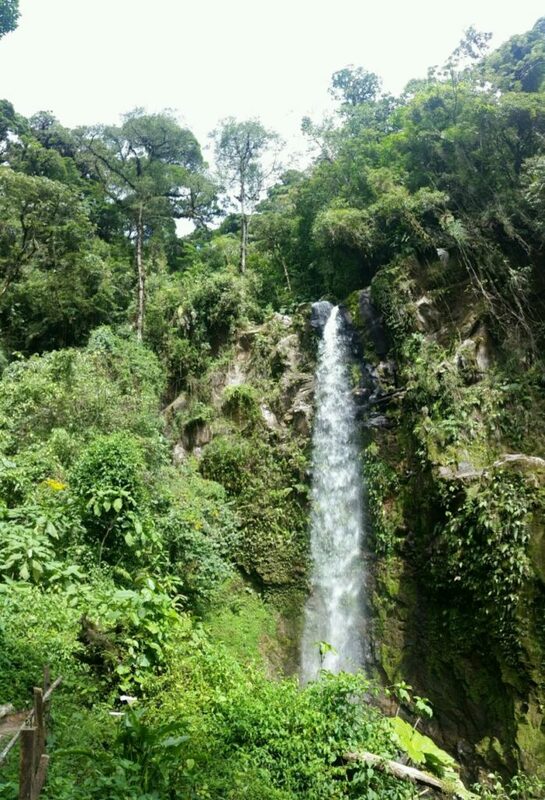 During our last days at the resort, we took a hike through the rainforest to three waterfalls. The hike was difficult for me, I must admit. I was the only woman, and my two male companions (husband and friend) both worked out regularly. Our guide was a wiry 27-year-old local man who never even broke a sweat. He was very knowledgeable. At one point, he picked a berry and broke it open to release the familiar scent of citronella. Apparently, this was just one of several varieties of citronella that grows in the rainforest and is, of course, a natural insect repellent. So, naturally, we all proceeded to rub the berries on our arms. Shortly afterward, while hiking between the first and second waterfalls, my husband exclaimed that I was covered in bites. Not unusual, really; insects love my Greek blood. When I looked more closely at the spots on my arms I realized they weren’t bug bites at all, they were hives! Hives that, according to my companions, covered my arms, neck, face, and chest. I’ve had systemic reactions before, so I normally carry an EpiPen or Benadryl when I’m hiking in the US, but of course, I hadn’t brought one with me. I ventured forth regardless, and we made it to all three waterfalls. By the time we arrived back at our vehicle, my hives were just red splotches. I was hot, sticky, sweaty, and exhausted, but pleased that I was able to survive the trek. And, after our grueling adventure, the free beer and drinks during happy hour at Los Establos never tasted so good! Tip #8: If you have allergies (or other health conditions), be sure to bring your meds with you. And, if you have extreme allergies, make sure to bring your EpiPen. You are likely to encounter new food, plants, animals, and other potential allergens on your trip, and there might not be a pharmacy convenient to your location. We decided to take it easy the following day, opting for a low-key tour to los cangilones, a lava-formed mini canyon near the town of Gualaca. We had to walk down some stairs to reach the canyon (legs protesting), but once there all we had to do was bask on the sun-baked rocks and swim in the cool, clear water. This is a popular spot with locals, and our guide/driver stayed with our belongings while the four of us went for a swim. Though we’d been warned that the water might be a bit chilly, it felt like bath water when we jumped in. It wasn’t cold at all! The cliffs varied in height, up to 8 or 9 feet high, and some people were actually free bouldering up the cliff faces. The water was a beautiful, clear green, with some small rapids to float through. It was a lovely, relaxing day, and fun to see yet another area of Panama. On our final day in Boquete, we had planned to stay at the resort, relaxing. Our traveling companions couldn’t stand the thought of just sitting around, however, so we decided on one last hurrah instead: we went whitewater rafting. This trip was not through our, resort but was rather arranged through one of our guides from another tour. This is a locally owned adventure company. The owner was our river guide, and had been guiding rafters for over 20 years. 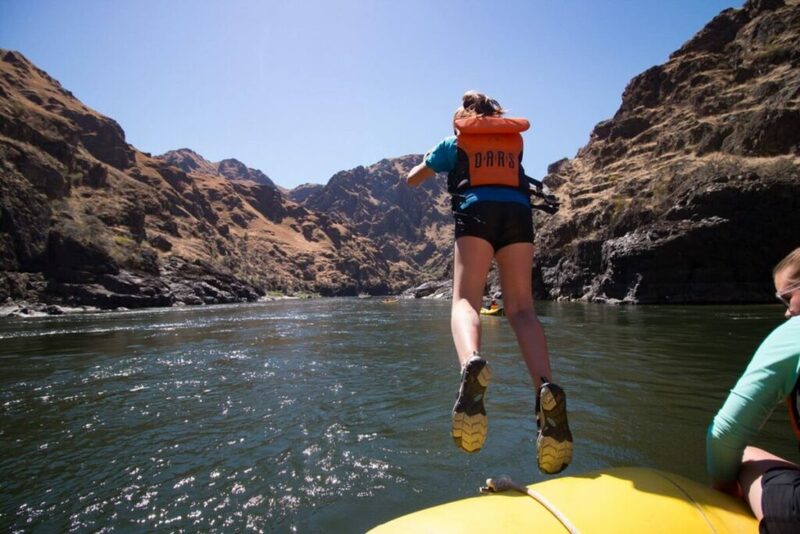 Although I have been whitewater rafting on much more challenging rivers, it was still pretty exciting – we had two people catapulted out of our raft going through some rapids! The water felt very warm to us, though the guide said it was colder this time of year. We all agreed this was a perfect way to end our trip, and we were even back by 3:00 p.m. so had plenty of time to rest and recover before our trip home. Areas such as Boquete, Panama, are just beginning to shape their tourist industry. When I hear people talk about visiting Panama, I mostly hear about cruises through the canal and touring Panama City, but they seem to be missing an entire country full of diverse vegetation, wildlife, waterways, and wonderful, kind people. If you must see the canal, by all means — it is worth seeing. But, you don’t need to spend all your time on a cruise ship to do it. Personally, I would skip Panama City altogether, and go straight back to Boquete, where adventures are abundant and the laid-back atmosphere is worth going out of your way for. I have traveled all over the world, and this trip to Panama made my top three favorites. I left Panama with a sore but satisfied body, a deeper appreciation for the country and culture, and great memories that will be with me forever. Melissa holds a couple of Bachelors degrees from Eastern Washington University. She has always had a passion for adventure and travel and even told her husband he had to have a passport to date her. She now drags him along on her adventures.